The Orange County Register article on Social Security's hearing backlog included a number of very interesting visuals. Here's one. This is odd. 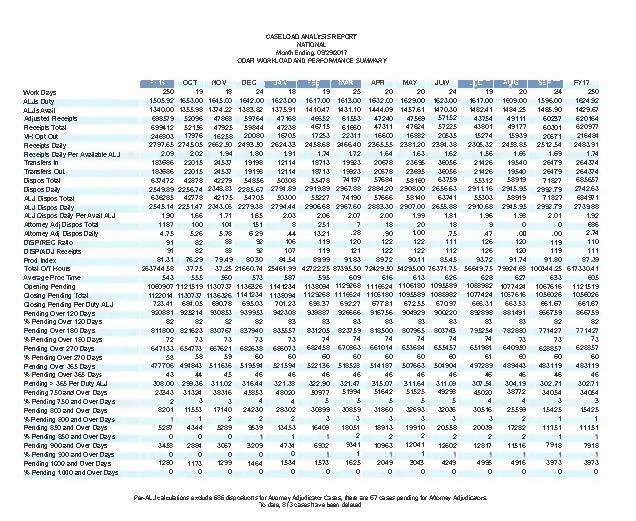 Why wouldn't Social Security have had the correct data as of October 13, 2017? It looks like someone goofed but the goof may have happened outside the Social Security Administration. In fact, it sounds like they're saying that someone else, perhaps Treasury, gave them incorrect information. I hope this doesn't cause problems. Programs used to compute payroll have to have the correct FICA wage cap. There will be problems if those programs aren't corrected. 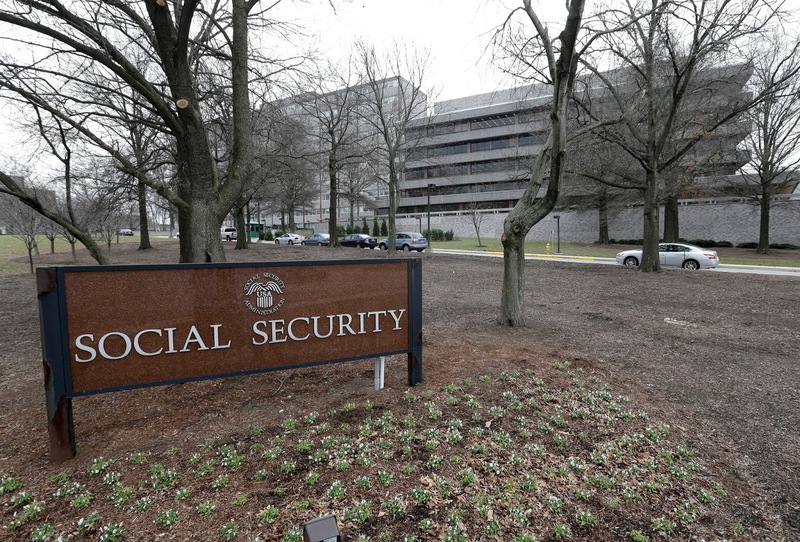 The Orange County Register has a report on Social Security's horrendous hearing backlog. As the story says, Republican ideology plays a part. Even though Republican voters in general support Social Security, the Republican donor class hates Social Security so Republican officeholders underfund Social Security so that service deteriorates. Then they use the poor service as proof that government programs can't work. The First Circuit Court of Appeals has issued an opinion in Justinano v. Social Security holding that the federal court have no jurisdiction, prior to a final administrative decision, to review Social Security's termination of disability benefits due to allegedly fraudulent medical evidence. These cases arose in Puerto Rico but this is essentially the same as the situation when the first civil actions were filed in the cases of claimants who had been represented by Eric Conn. Note that no one is denying that there is jurisdiction to review a final administrative determination in these cases. Presumably, by now there are final administrative determinations to review. ... [U]ntil 1996, income from Social Security was one of the few sources that people with debt could count on because the benefits were off limits to creditors. Unlike your paycheck, which is subject to garnishment if you are late on a payment, your Social Security benefits were protected from debt collection. But in that year, Congress enacted the Debt Collection Improvement Act. That bill gave our government the power to seize a portion of Social Security benefits for the repayment of student loans, Veterans Administration home loans, food stamp overpayments and the like. It is ironic, at best, that Congress has exempted itself from a rule that limits private creditors. The government garnishing the very income that provides such modest support and lifts so many people out of poverty is plain wrong. Let’s look at student loans as one example. It is no news that our nation is facing a student loan debt crisis. However, despite popular belief, student debt is not only a young person’s problem. People 65 and older owe billions of dollars on outstanding student loans. As the population ages, the amount owed by older Americans continues to increase. Some of this debt is decades old, incurred when older Americans sought higher education. Some is the result of co-signing loans to help their children and grandchildren. If the loans can’t be paid off, they will follow you into retirement. Student loans owed by seniors are much more likely to be in default than student debt held by younger Americans. In 2013, 12 percent of federal student loans held by those aged 24 to 49 were in default. In contrast, 27 percent of federal student loans held by those aged 65 to 74 were in default. For those aged 75 and older, the default rate spikes to more than 50 percent! That’s where Social Security comes into play. If the student loan was made by a private bank or other financial institution, your Social Security benefits are safe. But if the loan was made by the government, a portion of your hard-earned Social Security benefits can be grabbed without your permission. This garnishment of Social Security benefits is happening and at an alarming rate. The number of retirees and people with disabilities who have had a part of their modest Social Security benefits seized by the government to pay off student loans tripled between 2006 and 2013. And this number is projected to grow dramatically in the future, as the cost of education continues to balloon and our population ages. A local mother is speaking out for disabilities awareness after her 4-year-old daughter was denied access to accommodations needed to treat her disability at the Temple Social Security office. Scarlett Barker-Thomas has a metabolic disorder that keeps her body from regulating blood sugar properly. Because of this, she loses energy quickly and needs frequent feedings through a tube in her stomach. Scarlett’s mother, Terrin Barker-Thomas, said she and her daughter visited the Social Security Administration office in Temple on Nov. 13. When she tried to bring in a small bottle of apple juice for her daughter, Barker-Thomas said a security guard told her that was against the agency’s food and drink policy, and that any feeding would need to be done outside. Barker-Thomas said she tried to explain her daughter’s situation to the guard, but he still refused. The Social Security Administration later apologized. The Motley Fool has a list of what it considers the eight pivotal dates in Social Security history. What do you think of their list? 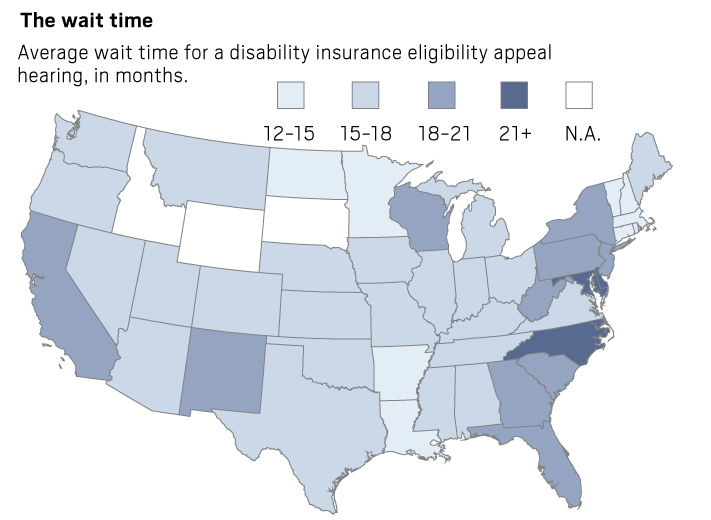 The Washington Post has another in its series on Social Security disability. The stigmatization is still there -- focusing on an uneducated claimant, a photo of an extremely messy home, a mention of drug abuse -- but the primary focus is on the suffering that Social Security's hearing backlog causes for disabled people and the cause of that backlog, inadequate administrative funding. Still, articles such as this suggest that the problems caused by Social Security's hearing backlog aren't near by. They're out there. They only affect stupid people living in rural areas who are drug addicts. I don't have to worry about this because it doesn't happen to people like me. Let me suggest to the Post's writers that they don't have to travel far to find disabled people to write about. I expect that they can find them within a couple of miles of their offices. They can easily find people with the same problems who have college educations. 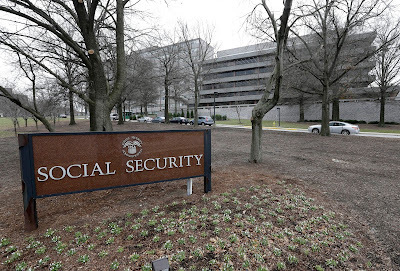 There are plenty of people their readers can identify with whose lives have been devastated by Social Security's hearing backlog. It can even happen to reporters. By the way, I do not tell clients that they should avoid work while awaiting a hearing. I do tell them that regular work, even part time work, can affect their case. Theoretically, if it's below a certain earnings level, it's not supposed to but in the real world it can affect perceptions. Anyway, most claimants who return to work, even part time work, don't last long. Also, by the way, I don't require that male clients wear a dress shirt to their hearing, much less to meet with me. ... [O]ver a 10-year period, Americans aged 54 to 64 who were in the lowest wealth bracket (with financial holdings of $39,000 or less) faced a 48 percent risk for developing a disability and 17 percent risk for dying prematurely, the investigators found. By comparison, their peers in the highest bracket (with holdings equaling $560,000 or more) had a 15 percent disability risk and 5 percent premature death risk. The fact that people in England are guaranteed cradle-to-grave government-run health care coverage, while Americans are not, did not seem to have much effect. This is from a report by Social Security's Office of Inspector General (OIG). Online services will only get the agency so far. Social Security needs more funding so it can hire more warm bodies to get the work done. 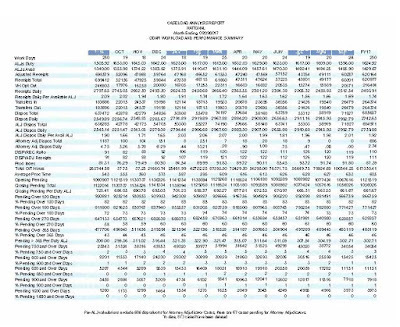 Devote Estate Tax Revenues To Social Security Trust Funds? [T]he bulk of income gains captured by the wealthy either fall above Social Security’s maximum earnings contribution cap (currently $127,200), or are unearned income on which they do not pay Social Security contributions. The tax bill that Republicans hope to pass would potentially have effects upon Social Security. It would trigger budget rules that would demand significant cuts in Social Security and Medicare. Congress would still have to pass those cuts but they would have held a gun to their heads to force themselves to do so. However, the bill would end a tax loophole that has allowed many professionals to avoid the FICA tax that supports Social Security by using pass-through corporations. "Backlogged To The Point Of Near-Absurdity"
...[T]he system is backlogged to the point of near-absurdity. Local applicants can wait up to two years for a hearing before a judge, with many cities facing longer waits. A hearing is scheduled after applicants have already been denied — as most typically initially are — a process in itself that can take up to eight months. A staffer in the Washington, D.C., office of Rep. Sam Johnson, R-Texas — who is a member of the House Ways and Means Committee where he serves as the chairman of the Social Security Subcommittee and sits on the Health Subcommittee referred calls to health adviser Darren Webb. A Fort Worth woman who has had breast cancer, has undergone heart surgery and suffers from chronic obstructive pulmonary disease that limits her lung functionality to 54 percent, filed her initial disability claim two years ago. She isn’t scheduled for her hearing until early 2018. When a Social Security Administrative Law Judge holds a hearing, there's always someone helping him or her -- escorting the claimant and attorney into the hearing room, operating the recording equipment, taking notes, etc. I've heard this person referred to as a hearing recorder or monitor or reporter. Some years ago, the hearing recorder was a regular Social Security employee. Then the agency began using contract workers to do the job. The hearing recorders were paid a set amount per hearing -- as long as the claimant showed up for the hearing. 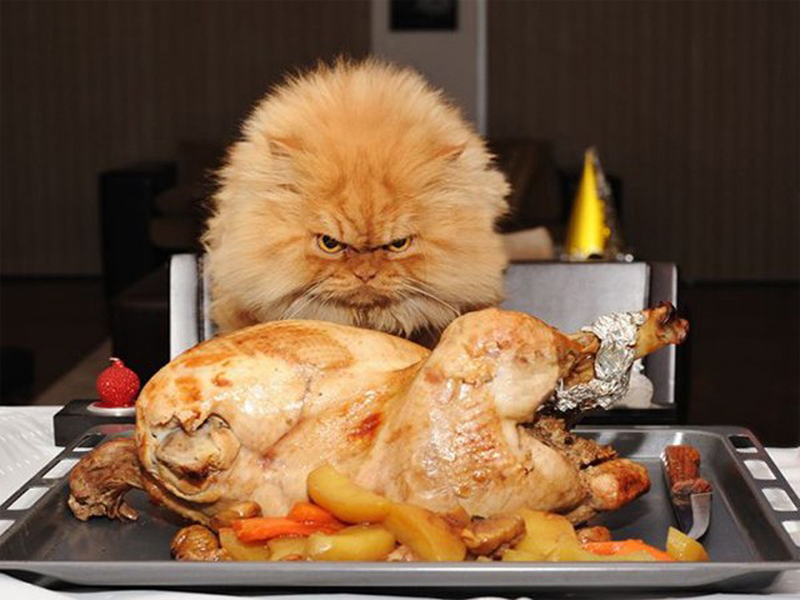 When my client failed to show up for the hearing, I wasn't the only one who was disappointed! The contracting was done on an individual basis with each hearing recorder. We've now heard that Social Security has decided to contract with a firm which will hire and manage hearing recorders to provide this service generally. I don't know how widespread this is. It covers at least all the hearing offices in North Carolina. This will start at the beginning of 2018. The contractor that has been hired has informed the current hearing recorders in North Carolina that they can continue the work but that they'll be paid 40% less. Almost all of the hearing recorders I've talked to have told me they're not interested in taking a 40% pay cut and working for the new contractor. Like a lot of jobs, the hearing recorder job may seem easy to perform and not that important -- until you get someone performing the job badly. I'm concerned that because the job will pay so much less that the new people hired will be unable to provide quality service. I know that at best there's going to be problems and frustration come January. I'd Call This Answer Seriously Incomplete -- Why? In my daughter’s senior year of high school, she had an accident that paralyzed her. It doesn’t look like she will be able to work in the near future, and since she has never worked she hasn’t paid Social Security taxes. Can Social Security still help her? Your daughter may qualify for Supplemental Security Income (SSI) benefits. SSI is a needs-based program paid for by general revenue taxes and run by Social Security. It helps provide monetary support to people who are disabled and who have not paid enough in Social Security taxes to qualify for Social Security disability benefits. To qualify for SSI, a person must be disabled, and have limited resources and income. For more information, visit our website and check out our publication, “You May Be Able To Get SSI,” at www.socialsecurity.gov/pubs. This may have been prepared by some press officer at Social Security rather than by Ms. Fisher. In any case, it's an incomplete answer. It's the sort of thing that is often, perhaps usually, missed. What is it? I think that half the press articles about Social Security use this same bleak stock photo. Why can't they do better? Is that how we want people thinking about Social Security? Here's a few links to give you an idea: St. Louis Post-Dispatch, USA Today, Seattle Post-Intelligencer. What would a better illustration look like? Social Security Numbers Must Go? “Some combination of digital multi-factor authentication… is the right path,” former Equifax CEO Richard Smith said when asked about such a program. This service will be available for Supplemental Security Income (SSI) recipients in the future. SSI recipients should continue to report wages through SSI Mobile Wage Reporting, SSI Telephone Wage Reporting, or by visiting a local field office. No matter where they came from, people born outside the United States but working here are much less likely to receive Social Security Disability Insurance benefits than those born in the U.S. or its territories. Foreign-born adults, according to a study published in the December issue of the journal Demography, are less likely to report health-related impediments to working, to be covered by work-disability insurance, and to apply for disability benefits. 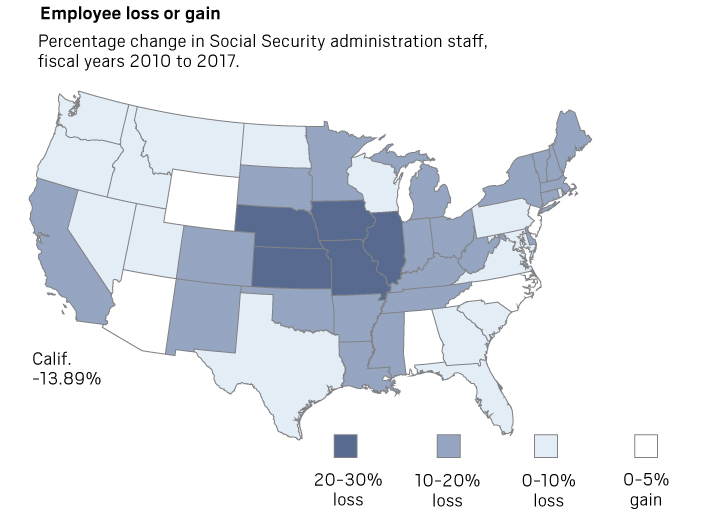 The researchers used data from the American Community Survey (ACS) to determine the prevalence of work disability and records from the Social Security Disability Insurance (SSDI) program to determine the incidence. They found that over the ten-year period from 2001 to 2010, about 6.56 people per thousand born in the U.S. received benefits through the SSDI program. I don't think this means much. Many of the native born Americans who end up receiving Social Security disability benefits have health problems that were coming on for a long time, sometimes since birth. People who emigrate are unlikely to have serious, chronic health problems at the time they emigrate. If they had been sick, they probably would have stayed in their native countries. The addition of healthy productive workers is one of the many ways that America benefits from immigration. In order to take appropriate actions, SSA’s automated debt collection systems have always interfaced with an MBR or SSR [databases of those entitled or potentially entitled to benefits] for the debtor. In cases where the debtor did not have a master beneficiary record, debt collection required manual control and efforts. The purpose of the NED initiative is to create an automated system for controlling debts (both overpayments and incorrect payments) owed by people who do not have master beneficiary records. Therefore, SSA developed the capability within the Debt Management System (DMS) to identify, record, collect, and otherwise resolve debts owed by NEDs. A South Bend woman who worked for the Social Security Administration was convicted in federal court of ten counts of making false entries in government records, two counts of conversion of government money, and one count of wire fraud. Sharon Ramos, 56, was convicted after a four day jury trial. The United States recovered $200,000 as a settlement of allegations that Stephen G. Ackerman violated the federal False Claims Act by improperly accepting Social Security Disability Income payments and misleading the Social Security Administration (“SSA”) about his work activity, acting U.S. Attorney Bob Troyer announced. Did Mr. Ackerman buy his way out of criminal charges? A Metairie man was sentenced Wednesday (Nov. 1) to nine months in prison for hurling a "medium to large sized rock" through a second-floor window of the U.S. Social Security Administration's office in Kenner, according to federal court documents. In a separate item, the affidavit shows that Hammond's mother told investigators she used to be the payee for her son's Social Security checks, but he had asked her to remove herself, which stopped the checks from being deposited into her bank account. The Vermont Legislative Joint Fiscal Office is asking why there is a higher percentage of Vermonters drawing Social Security disability benefits due to mental illness than the national average. I'll give them an answer they haven't considered. Vermont is in Social Security's Region I. That Region has long had higher approval rates than other Regions. Regions matter since Regional Office Quality Assurance reviews most favorable determinations (but few unfavorable determinations) made within the Region. Mental illness disability determinations are particularly sensitive to differences in adjudicative climate. Here's another writer who thinks that people will fly off the disability rolls if we just tinker with work incentives. We should change it from a cliff to a ramp but I'm telling you that it will make little difference. We've had near continuous tinkering with work incentives since the 1960s -- yes, the 1960s -- to no effect. Additional tinkering won't matter much. There are two fallacies underlying all this tinkering -- the belief that it's not that hard to get on disability benefits and that people who go on disability benefits will eventually get better. Neither is even a little bit true.